The time and place, Victorian England on the cusp of a new century where the marvels of science will spur the Industrial Revolution to new heights of cultural wonder. And yet amidst this societal upheaval, the dark elements of humankind continue to worm their way through the streets of London and its surrounding countryside. Murder and mayhem remain and thus the work of Sherlock Holmes continues; his powers of deductive reasoning are the crucial bulwark to stem this tide of villainy. Here are five new adventures of Holmes and Dr. Watson written in the traditional style of his creator, Sir Arthur Conan Doyle. Writers I.A. 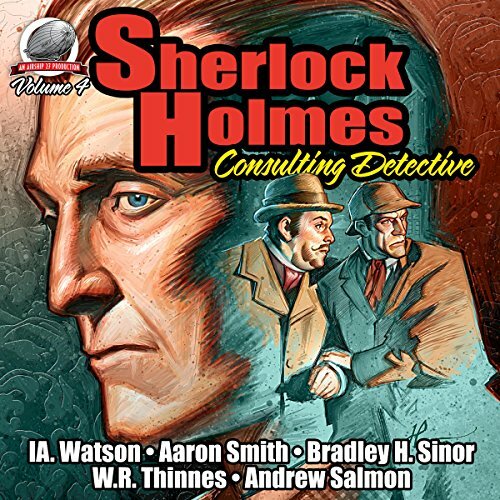 Watson, Aaron Smith, Bradley H. Sinor, Bill Thinnes and Andrew Salmon deliver a quintet of truly memorable cases to challenge the famous crime fighting duo. From the murder of a man who collects clockwork automatons to the theft of a valued Japanese sword, our heroes are once again called into action confronting a diverse set of mysteries guaranteed to entice the world's greatest consulting detective. The fourth volume in this best-selling series also features a fascinating essay, "The Mystery of Mr. Holmes", by I.A. Watson. Here is grand adventure as Sherlock Homes fans around the world have come to expect from Airship 27 Productions.